In his media availability at Dover on Friday, Denny Hamlin went out of his way to question some of Clint Bowyer's assertions from earlier in the day during his spirited defense of his team. In whole, Hamlin said, "Our car came back and it was correct, but it wasn’t built incorrect and that’s one thing that their car was -- was built incorrectly. You can talk about how small the thing was off and you can really try to say that 60-thousandths didn’t help him (Clint Bowyer) perform any better -- that is a crock. Let me tell you something, that helps a lot. I know when we gain five points of downforce our car runs a ton better. He wasn’t speeding on pit road by a half-a-mile per hour he was speeding by 5.5 miles-per-hour. You always want to win races. You're very proud to win races and I'm still proud of that win. I don't believe that we did anything wrong. I guess I'll go on record and say that, first and foremost, in my opinion. I want my fans to know that. There is a lot of integrity that goes into this sport. I'm damn proud of being a part of this sport. I love this sport and I wouldn't cheat to win a race in this sport. We have a lot more integrity for myself and our race team at RCR. Hopefully I only have to do this once. I woke up about 6 o'clock this morning, which is uncharacteristic for me. I just grabbed a notebook and wanted to make some notes. You know, for myself and for you guys. I know a lot of you guys have a lot of questions; trust me; there are a hell of a lot of questions that I have too. And I'm going to go through them. I like to have facts when something like this comes down. I've got a timeline of facts. I'm going to start with number one: We were warned after Richmond that the car was too close to tolerances. Number two: We were told by NASCAR they were taking the car after New Hampshire, no matter what; first or 43rd. Number three: The car passed pre and post-race inspections at the race track. Number four: Monday, the rumors started about all this and in my opinion, forced NASCAR's hand to do something about it. Number five: Wednesday came and it was a 150-point fine. And the sixth thing, and at least an answer, you know, I'm looking for answers too. There are several things but one of them is a two-ton wrecker pushed me to victory lane. I'm going to elaborate on them. I think the first one (is) we were warned that both sides of the car were high after Richmond. Both sides. After the race in New Hampshire, after it got back to the Tech Center or whatever they call that place, just the left side was high. I think this shows that we definitely had it fixed; something within that race happened. Number two: after being told that they were taking the car, we made double-sure before it went to New Hampshire that that car was right. Who in their right mind, knowing that they're going to take that car, wouldn't have made triple sure that thing was right before it went to the race track? I could have hit the wall doing a burnout, I could have done a lot of things that other drivers have done and that other teams have done in a post-race celebration this year. I didn't. We didn't want to push that in NASCAR's face. We appreciated them warning us on the fact and we tried to fix the situation. They told us about that situation Wednesday. Wednesday the car leaves. We had about two hours to jump on that car and make sure that thing was right. And number three: The car passed pre and post-race inspection, and three days later get such a huge fine? They take the car apart, completely apart to measure this thing and in my opinion that's not the way the car was raced on the race track. I think that's something to be said. Number four: Once the rumors started it wasn't long before the penalty. 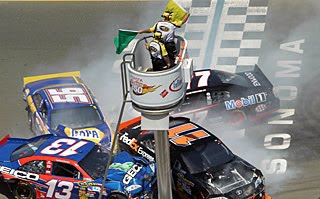 I think NASCAR has a lot of problems with a lot of cars on the race track being out of the box and I think they needed to set an example with something. Number five: I don't think the penalty fits the crime. Sixty-thousandths of an inch, folks. Grab a quarter out of your pocket (holds up a quarter). That's sixty-five thousandths of an inch thick. Less than the thickness of that quarter right there resulted in a 150-point fine. Before or after this, grab that and ask yourself if that was a performance-enhancing thing right there. And the last thing, my question is, is it possible that a two-ton wrecker could bend the quarter panel of this thing sixty thousandths of an inch? You have to ask yourself that. I got hit during the race, turned a couple of times; racing is tough. Now if this thing was knocked out a half of an inch, I could see something being made. But if it passed the height sticks afterwards, the very height sticks the No. 48 (Jimmie Johnson) and the No. 11 (Denny Hamlin) did not pass, then miraculously enough when that same pit crew pushed it back around after 20 minutes it passed, that was pretty amazing. You know it passed those same sticks. You know, my dad owns a towing business and has since I was born in 1979. I know a little something about wreckers. About 15 years ago they took them push bumpers off the front of them for this very reason. I remember back when people used to come (during) a snow storm and (say) please, push me out of the snow bank. You push them out of the snow bank and two days later they'd show up with a body shop bill in their hand, wanting you to pay the body shop bill for the damage you did to the back of their car. This could happen. That's the only question I had for you guys (media) is to ask yourselves if it is possible for that to happen. That's all I've got to say. WHERE DO YOU THINK THOSE RUMORS BEGAN AND HOW DID THEY GET OUT AND ARE YOU ANGRY ABOUT THAT? I'm angry about the whole thing. This tarnished my win. It's something you're very proud of. I'm very angry about it. I'm angry for my fans for our sponsors. I'm angry about it. I think that there are a lot of things a lot of people don't know about, media included, and I don't understand it about as much as you do. So I found myself all week, instead of celebrating a win, trying to figure out what the hell they were talking about. The rumors, in my opinion, I truly believe that these rumors forced their hand in making a decision. WHAT PERCENTAGE OF THE CARS ARE ILLEGAL EACH WEEKEND? HOW DO YOU RESOLVE THAT ISSUE? I think NASCAR does a great job of policing and maintaining common ground. Look at the racing. Now last year and the last two years, when an organization was as dominant as they were, do you think they had something up on the competition? This year it's as close as it's ever been. I think it's pretty damn good racing on the race track. I think it's the best as we've had since this car was put into inception. So, I think they do do a good job. I respect the fact that what they have to look at each and every week. My personal opinion, I don't like the R&D Center. I think what you bring to the race track is what they inspect. And, you know? Three days later the car the car (is) completely taken apart from something that you haven't even raced. I mean it's a completely different vehicle, you know? You take the suspension off the thing; these are all components that bolt on. It ain't a decal you took off. These things are bolted on and could interrupt the way the car is measured. How can that possibly be kept in the same box? So I think there is a lot of cars that are close to being on the out of the box side. I think that's what crew members and crew chiefs are paid to do and you know, yeah; I do think there are a lot of cars that are very close. I think they do a good job. I appreciated the fact that they warned us, you know? That's why we tried to fix the thing. That's why we did fix the thing before it went to New Hampshire so this wouldn't happen. Not to rub it in their face and say well you know what you're talking about, we're going to continue to do this and don't think you're going to do anything about it. I mean you've got to appreciate this sport and respect the sport and we darn sure did and it bit us in the rear for it.